Are mushrooms toxic to dogs? Amanita virosa mushrooms, or Death Angel mushrooms, are highly toxic to dogs and humans. Photography ©dabjola | iStock / Getty Images Plus. The first step in answering the question, “Can dogs eat mushrooms?” is understanding the difference between wild mushrooms and the ones we humans buy to eat from grocery stores. “The ones we buy in the grocery store are not toxic,” Dr. Heather Loenser, Senior Veterinary Officer with the American Animal Hospital Association (AAHA), explains. “However, there are several wild mushrooms that are and can cause serious consequences, including liver and kidney failure, vomiting, tremors, disorientation and seizures.” Death may sometimes result from ingesting toxic mushrooms, too. If you or your dog find a mushroom growing in the wild, assume that the mushroom is toxic and keep your dog away from it. 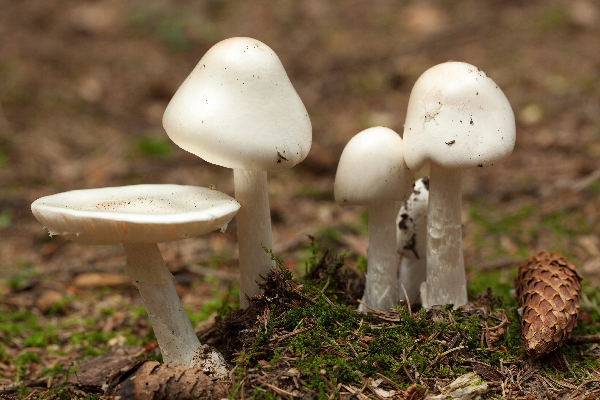 One of the challenges with identifying toxic mushrooms is that some species may “vary considerably in their toxicity from year to year and location to location” an ASPCA report on mushroom toxicity notes. This makes it especially challenging to determine what mushrooms are safe and which aren’t. There are several mushroom species that are toxic to dogs that are found in North America. The most toxic mushroom to dogs is the Amanita species of mushroom. “Amanita species are the most commonly documented cause of fatal mushroom poisonings in dogs, and they account for 95% of mushroom-related fatalities in people,” the ASPCA reports. These mushrooms are commonly referred to as the “Death Cap” or “Death Angel” mushrooms and are unfortunately very attractive to dogs, because they have a very fishy odor. Dogs affected by toxic Death Angel mushrooms. Photography courtesy gofundme.com/Janna-sfurbabies. Recently, two North Carolina dogs — Drago, a 3-year-old Saint Bernard, and Adoni, an 8-year-old Lab-Retriever mix died after eating wild Amanita or Death Angel mushrooms growing in a yard. Four other dogs in the same yard became very ill and required hospitalization. 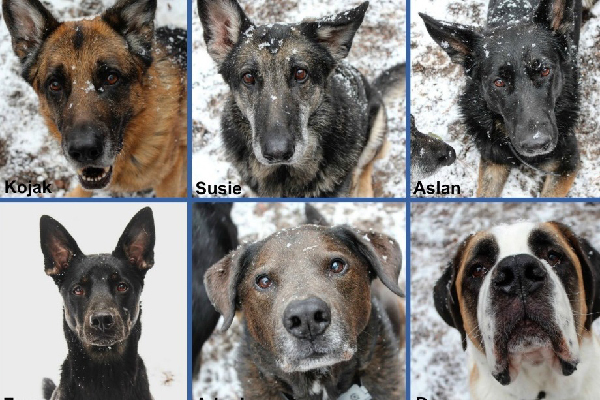 A GoFundMe was set up to help the foster mom of the affected dogs pay for medical treatment. If your dog eats any type of wild mushroom, or if you think your dog has eaten a wild mushroom, act quickly. Seek Care: If you believe that your dog has eaten a wild mushroom, seek immediate veterinary care. “Dogs start showing signs of toxicity between 15 minutes and 6-12 hours after ingestion,” Dr. Loenser explains. “If your dog eats a wild mushroom it’s essential to get to a veterinarian right away, even if your dog is not yet showing symptoms. Bring Samples: “If possible, bring a sample of mushrooms with you to aid in identification,” Dr. Loenser advises. “There isn’t a specific ‘antidote’ for a specific species, but it will help the veterinarian provide supportive care to your dog. If your dog is showing signs of poisoning, expect that your veterinarian may try to induce vomiting, perform bloodwork and recommend hospitalization. If you need help finding a hospital that is accredited by the American Animal Hospital Association, visit aaha.org/locate.” For transporting the sample to the veterinarian, the ASPCA recommends wrapping the mushroom sample in a moist paper towel, or paper bag instead of putting the mushroom in a plastic bag. Spring Cleaning: Do a spring cleanup of your yard, removing any and all mushrooms. Monitor: Mushrooms grow very quickly, so monitor your yard regularly to ensure mushrooms haven’t started growing. Supervise: Always supervise your dog when he’s outside. Don’t leave your dog unattended in your yard. If you and your dog are hiking or visiting parks where mushrooms may grow, be sure to keep your dog on his leash. Make Sure Your Dog Knows the “Leave It” Command: If you haven’t already trained your dog to successfully “leave it,” now is the perfect time. It could literally save his life. Can dogs eat mushrooms from the grocery store? Now that we’ve covered what to do if your dog eats a wild mushroom, can dogs eat mushrooms from the grocery store? So, as with most human foods, feed edible, store-bought mushrooms to your dog sparingly and free from any seasonings and sauces. Thumbnail: Photography ©bksrus | iStock / Getty Images Plus. Celery? Is Celery Good for Dogs? The post Can Dogs Eat Mushrooms? What to Know About Dogs and Mushrooms appeared first on Dogster.